Lawyer, utility executive and advisor to governors, William B. McGuire helped build Duke Power into a major utility company affecting the Southeast. Junior Achievement Born in Franklin County, William graduated from Davidson College (economics) in 1930 and then Duke University's Law School in 1933. After graduation, he joined Duke Power Company as assistant general counsel. 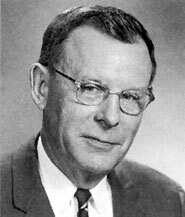 In 1954, he was named as director on the board. In 1956, he was named as assistant to the president and then, president on October 28, 1958. That year, Duke Power had total revenues of $143 million. He assumed the president's role on Jan. 1, 1959. During his term, he ushered in the use of nuclear power generating stations. He retired from Duke Power Company on April 28, 1971. At that time, Duke Power has annual revenues of $386 million. Among his many activities, he served as director of the Edison Electric Institute and the Research Triangle Foundation, as well as a trustee of the Duke Endowment. He also was president of the North Carolina Citizens Association (now North Carolina Citizens for Business & Industry) in . He also was chairman and director of the Charlotte branch of the Federal Reserve Bank of Richmond. He was a member of the NC Governor's Council for Economic Development and the Governor's Study Commission for the Public School System. He served on many boards, including Springs Mill, the Duke Endowment and the Piedmont and Northern Railroad. William McGuire received honorary doctorate degrees from Davidson and Pfeiffer Colleges. He married to Grace Robinson and they had four children.